Following on the Durrell 2012 centenary celebration in London hosted by the British Library and Goodenough College, the 18th biannual conference of the International Lawrence Durrell Society (On Miracle Ground) will take place in Vancouver, British Columbia, at Fairleigh Dickinson University. The conference will open with a reception on May 14th at the main venue, Fairleigh Dickinson University – Vancouver. 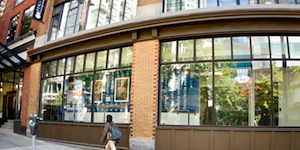 FDU’s Vancouver campus is in the heart of downtown Vancouver in the lively and young Yaletown district. The site is one block from the Vancouver Public Library or the waterfront in False Creek. It is also conveniently within walking distance of both the Canada Line, Expo Line, and Millenium Line for the SkyTrain. Vancouver’s historical China Town is a short stroll away, as are Gastown and Coal Harbour. The Granville Island Market is a short jaunt away by Water Taxi, and the culturally dynamic downtown is on every side. The sessions will all take place on site at FDU’s state-of-the-art urban campus. The conference hotels are all within a block. 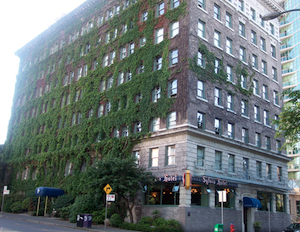 The conference site is also surrounded by Vancouver’s literary history. The adjacent building, the Catholic Archdiocese, features in the opening pages of Margaret Craven’s I Heard the Owl Call My Name. Dylan Thomas spoke (and drank) nearby. And dozens of Vancouver authors draw on nearby locales, ranging from Wayson Choy’s The Jade Peony, to Malcolm Lowry’s short fiction, to George Bowering’s Standing on Richards, to some of Alice Munro’s most striking short stories. We conclude the conference with a banquet at the “literary hotel,” the Sylvia Hotel’s Bistro in English Bay, facing into the waters and Stanley Park. Apart from the building’s numerous literary responses, from children’s books about the hotel’s cat “Mr. Got To Go” to George Featherling’s award winning The Sylvia Hotel Poems, it was built in 1912 facing into the Pacific Ocean in the same year Lawrence Durrell was born on the far side of the waters in India.